Living in paradise is not without its challenges. Take, for instance, when your luxury vehicle ends up infested with cockroaches. That’s what happened to a Hawaiian man’s BMW last week after he parked it for a few days under a tree at Kona International Airport. 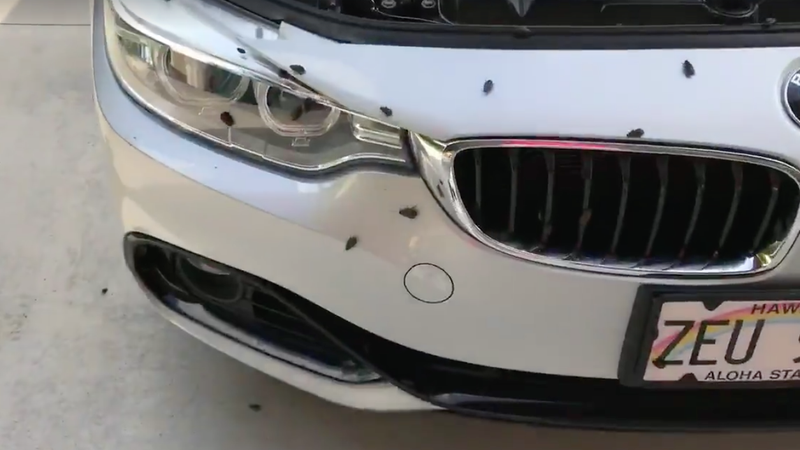 TV station KITV reports that after pulling into his driveway, Blake Howell saw something crawling out from underneath his car’s hood. He grabbed his phone and an extra large can of bug spray and filmed this. Howell told the station that after doing battle with the bugs and killing so many that he had to hose down his driveway, he still can’t claim victory. He’s finding little roach corpses in his driveway to this day. “I joked with somebody that if they had actually been in the interior I probably would have had to set the thing on fire.” Howell told KITV. Is fire actually off the table, Blake? Because you may have to torch your Bimmer. And your house. And maybe your whole block just to be sure.